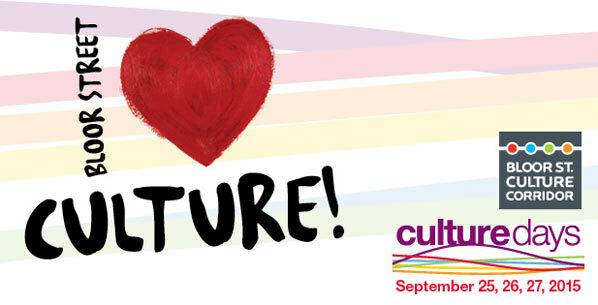 “Culture Days is committed to reaching the goal of having all Canadians in every community declaring “I Love Culture” and making culture a daily habit. With the support of volunteer groups at the national, provincial and local levels, hundreds of thousands of artists, cultural workers, organizations and groups, volunteers and supporters self-mobilize to host free participatory public activities that take place in hundreds of cities and towns throughout the country over the last weekend of September each year. Bloor St. Culture Corridor in Toronto, Ontario, is also offering a vast array of celebratory events and activities as listed in the press release below. This video presents Conduct Us: The Baton. In preparation for Conduct Us, the national Kick-off of the 5th Anniversary Culture Days weekend at Roy Thomson Hall on Friday, September 26, Culture Days and the Toronto Symphony Orchestra present a series of fun Learn How to Conduct videos starring esteemed conductor and TSO Musical Director Peter Oundjian and Colm Feore. Conduct Us invites the public to chose from one of three well-known classical works and a once-in-a-lifetime chance to conduct a major symphony orchestra. For more information on the event click here: http://bit.ly/VNX5fG. TORONTO, Canada (September 18, 2014): The Bloor St. Culture Corridor, Toronto’s most diverse arts and culture district, will celebrate Culture Days, September 26-28, 2014, with a vast array of exhibitions, films, concerts, culture talks, and special events. Culture Days features free, hands-on arts and culture activities which invite the public to take a peek behind-the-scenes and try something new. Culture Days provides an ideal opportunity to invite the public to explore the range of activities offered by the diverse organizations of the Bloor St. Culture Corridor. At the Bloor St. Culture Corridor Hub, within one easily-walkable mile on Bloor Street West, culture lovers can enjoy FREE events at the Bloor Hot Docs Cinema, Tafelmusik, Alliance Française de Toronto, the Bata Shoe Museum, The Royal Conservatory, the Royal Ontario Museum (ROM), the University of Toronto Faculty of Music, the Gardiner Museum, and the Japan Foundation. The Bloor St. Culture Corridor Hub complete Culture Days Bright Spots Schedule is online: click here.